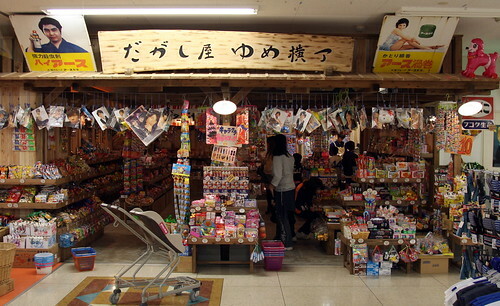 Retro Confectionary as Japanese Nostalgia, a photo by timtak on Flickr. Showa period (1926-1989) confectionery has been popular these past few years and the above shop specialises in its provision. The whole shop has been decorated to represent a bygone age. The UK has a few oldy-worldy sweetshops too, but I think that Japan has more of them. Tourism theorists (Creighton, 2009; Guichard-Anguis, 2009a, 2009b; Tomomitsu-Tomasson, 2005) point out that the Japanese want to visit hometown mountains (satoyama), "Edoic" (Creighton, 2009) places, and traditional Japanese hotels (ryokan, see Guichard-Anguis, 2009). This is due in part to the Westernisation of Japanese society, and the nostalgia for the lost traditions of Japan. This sweet shop is motivated in part by the same social phenomenon. The problem with this theory, that Japanese nostalgia is for a Pre-Western(ized) authentic Japanese self, is that, as reported in the same literature (Hudson, 1999 see Plutschow, 1981, p1-2; Nenzi, 2994) the Japanese were into nostalgia, and travelling for the purpose of nostalgia from well before the arrival of Western influence. Matsuo Basho was wallowing in nostalgia in the seventeenth century, continuing a tradition that had continued for centuries before, well before Japan became Westernised. Nostalgia is and, for millennia, always has been big in Japan. Another reason for the popularity of retro confectionery is because nostalgia is just big in Japan. I think this is partly because of the structure of the Japanese family. In the West we make our children sleep alone, prioritizing the relationship between the parents over that between parents and children. As the standard Freudian interpretation would have us know, Western children grow up looking forward to the time when they can have a home, and a bedroom of their own. British children are forced to invest in their future. They have a nest egg to look forward to. In Japan however, the relationship between parents and children (or at least between mothers and children) is prioritised over that between the parents. The children are treated with considerable indulgence. Japan is overall a very child friendly society. The Japanese are kind to their children. This sounds all very well and good but, when Japanese adults grew up however, they are socially required to repay the debt that they incurred as children. Japanese children are forced to take out a loan. But what can they look forward to? Nostalgia, for the time when they were loved as children. I think that this is another reason why sweet shops that sell treats from the generation before are so popular. This pack-back (Japan) v.s. pay-forward (the west) dichotomy is to my mind one of the biggest differences between Western and Japanese society. Of course, there are all sorts of variations within both cultures too. Guichard-Anguis, S. (2009). Japanese Inns (Ryokan) as Producers of Japanese Identity. In A. Guichard-Anguis, O. Moon, & M. R. del Alisal (Eds. ), Japanese Tourism and Travel Culture (1st ed., pp. 76–101). Routledge.